A team of scientists used the Hubble Space Telescope to measure the extent of the halo of the gas surrounds the Andromeda galaxy. It turned out to be much larger than expected stretching for about a million light-years from the galaxy. This means it reaches out to about half the distance that separates it from the Milky Way so if it was visible to the naked eye its size would be about a hundred times that of the full Moon. The results of this research were published in “Astrophysical Journal”. The Andromeda galaxy, indicated in various catalogs as M31 or NGC 224 is a spiral galaxy like the Milky Way. In some ways it’s a larger version of our galaxy with a diameter near 250,000 light years and an amount of stars estimated to be about one trillion. It’s visible to the naked eye under optimal conditions and it’s the most distant object visible without the need for instruments. Earlier research by the Hubble Cosmic Origins Spectrograph (COS)-Halos program studied 44 distant galaxies such as Andromeda finding halos but none so massive had never been seen in a nearby galaxy. Another study used the Chandra X-ray Space Telescope to study the halo that surrounds the Milky Way and its size was estimated to be at least 300,000 light-years in radius but could be even bigger. The gas in the halo surrounding Andromeda is dark so the researchers observed changes in the brightness of distant objects. The objects ideal for this type of observations are quasars, galactic nuclei that are very distant and very bright because they’re powered by black holes. In this research, they used 18 quasars behind the area of ​​Andromeda and its halo to examine how far it reached. It absorbs part of the light making the quasar appear a bit darker in a small range of wavelengths. The measurement of the brightness decrease allowed to estimate the amount of gas between us and the various quasars. One of the advantages of space telescopes is that they allow to see ultraviolet light, which is absorbed by Earth’s atmosphere. The researchers used data from about 5 years of observations with the Hubble Space Telescope. 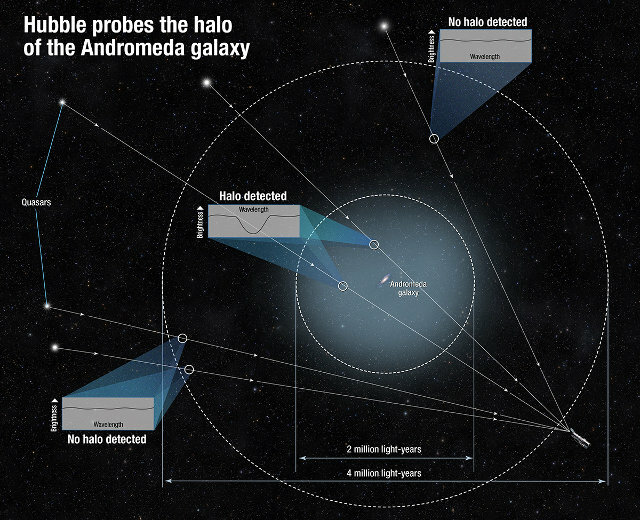 Previous research used Hubble to study halos of gas far more distant but in directions at least close to Andromeda so there were a lot of data available. Simulations made with supercomputers suggest that Andromeda’s halo was formed together with the galaxy. Over time it’s been enriched by elements heavier than hydrogen and helium, almost certainly thanks to supernovae. It’s possible that the halo that surrounds the Milky Way gets very close to that of Andromeda. They are meant to get closer in time until they touch because the two galaxies are slowly approaching and will merge into one massive galaxy beginning about 4 billion years in the future.